Alpha Percival is a common humanoid bakugan battle brawler. I like it because of its design. 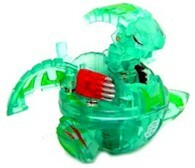 Its not a very complex bakugan. They come in great colors like black and red. We have a black and purple one of 720G. It is in great shape, opens and closes very tight. It has a working jaw similar to Abis Omega’s, and a short tail. Its main attribute is Darkus, owned by Ace. It is easy to close and opens, but it does not have a good chance of winning in battle if it has less than 600Gs. It is a core bakugan. We got ours for free from a friend, but on eBay, a good price would be around $2.50 with no cards included. In stores, it sells for about $6.50 with 2 cards. Alpha Percival is definitely a good Darkus bakugan to own and is worth getting if you can. I would not strongly recommend you to buy this bakugan in stores, since it has a higher price, but if you prefer it with cards, or want better quality assurance, you should buy it in stores. Purchase Alpha Percival from Amazon now!